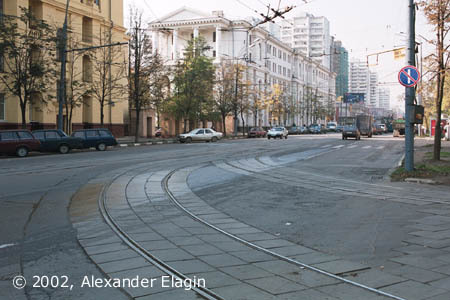 A radial tramline along Pervomayskaya Street in Izmailovo district of Moscow terminates at the crossing with 16th Parkovaya Street, where this reversing loop is located. The residential zone also ends here, and only orchards and hothouses of the decorative floriculture farm can be seen across the street. 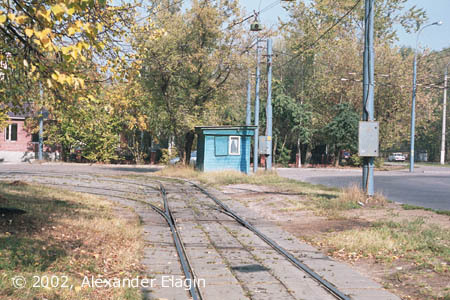 The regular tram service was started here on October 8, 1951; this was one of a few expanded tramlines built during the years of massive closures in the central parts of Moscow. 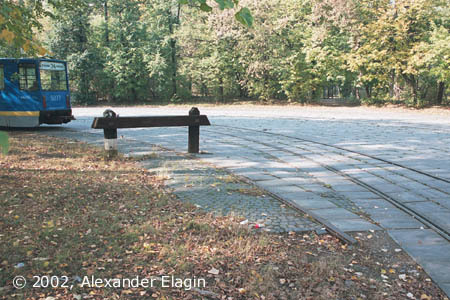 The 'Home' switches of the loop are placed along 16th Parkovaya Street. 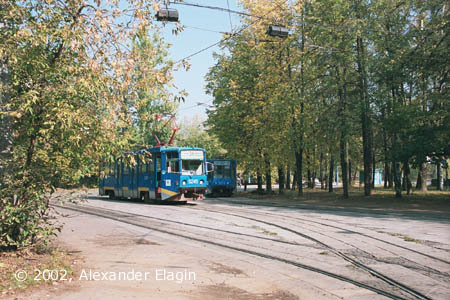 Another terminus can be seen to the right: it belongs to a trolleybus route 22 linking this district with one of the central squares of Moscow - Komsomolskaya Square. The terminus has three through tracks and one stub. Frankly speaking I am not sure whether the stub was not also a through track a while ago, as the track configuration suggests. A view of the loop looking from Pervomayskaya street. The terminus is used today by tram routes 11 and 34. One of the first KTM-19 vehicles on route 11 (#2034), spotted in the terminus. 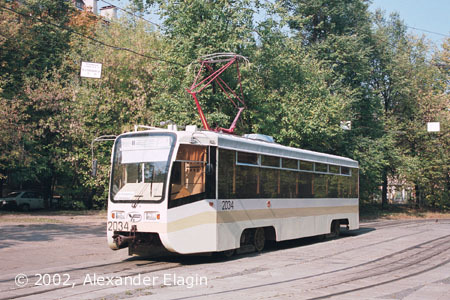 The trams of this type started their service on route 17, but as their number has been increasing, they now can be found on many routes in eastern and central districts of Moscow. An exit from the terminus to Pervomayskaya Street. A few old buildings along the street are followed by a row of typical residential blocks of flats erected in 1980s.